We welcome feedback on this issue. Letters should be signed and typed. They may be edited for publication. Submissions are also welcome and should be sent to the editor’s attention at the address below. Greetings Capers, It is an honour to have been elected President of the CBU Alumni Association, along with many new and returning board members who are excited to build on the success of past years and begin the process of building a vision for the future. Our primary mission is simple — to increase alumni engagement through a variety of local, regional and national programs designed to create a sustained connection with the Association — fostering the pride we all have for CBU. In the coming months, I hope you can be part of our Strategic Priorities, which will encompass a range of new incentives from communication development to marketing the Alumni Association. We have great success as alumni, and we need to take the time to truly celebrate these achievements. I encourage all of you to connect or reconnect with your fellow Capers to strengthen and build our Association. I am excited to serve our alumni community and look forward to meeting and engaging with you. Working together, we can build on our proud history at CBU. Always Orange! Aiding Jodie in her profession is the knowledge base that she gained as a BA student at CBU when she studied political science. She says, “There were several courses that I took that I still draw from today including Children’s Rights and Human Psychology and also Communication.” Jodie goes on to explain that, “A good characteristic that can assist a police officer with their role is to be a good communicator. Whether it be communicating with your peers or the public, good communication is a very important tool.” Jodie practices what she preaches and keeps the lines of communication open, especially for young women who are curious about her career path. Jodie says, “Gender-based stereotypes are lessening and more than ever women are changing the social norms. Women and girls today are increasingly filling a multitude of male-dominated positions. It is extremely inspiring to see these traditions and stereotypes becoming extinct and women becoming more and more confident of their capabilities and value in any profession they choose to pursue. I often answer calls from girls in the local area that have been debating entering policing, and I always make sure to tell them to prepare themselves for the career by attending university and obtaining a degree. You have to be selfmotivated and adopt a philosophy of lifelong learning because no matter how many years of service you obtain on the job, there is always more to learn.” As Jodie settles into her new role as Staff Sergeant, she’s grateful for the camaraderie and support of her colleagues. And she’s thankful that she still has the support of her family and friends. Just as they helped her to reach her full potential as a CBU student, then a Police Academy cadet, they are cheering her on as she makes history in a career that is truly her passion. Dr. Kevin McKague, Assistant Professor of Entrepreneurship and Strategy at CBU, and his team of experts including CBU alumna, Jill MacPherson, and advisor, CBU Hon.D.Litt., Dr. Andrew Lynk, are conducting a hands-on research project to help address the health care crisis in regions of South Sudan and Northern Uganda. Working with the non-governmental organization, BRAC, in Africa, they have seen that women and children are the main victims of conflicts and lack of adequate health infrastructure, especially in lower-income regions. From the field research, a promising option has emerged: innovative social enterprise business models. BRAC and CBU are combining their expertise in social enterprise to pilot test and evaluate the most promising social business models. The research is funded by the International Development Research Centre, the Canadian Institutes of Health Research and Global Affairs Canada as part of their Innovating for Maternal and Child Health in Africa initiative. The research to date shows four social enterprise business models that could allow community health workers to generate income while caring for mothers and children: MODEL 1: Selling baskets of health products - Community health workers can generate additional income through sales of medicines, personal care products and other household goods that promote family health and well-being. MODEL 2: Outreach from mission-driven private clinics This model uses a portion of the revenues from public-private partnership clinics and hospitals to pay for the free, door-to-door outreach of community health workers to low-income neighborhoods. MODEL 3: Cross subsidization from other enterprise activities In this model, non-healthcare related enterprises and utilities provide stable, year-round funding to support community health workers by offering a share of user-fees, levies or supplemental income. The customers of these enterprises and utilities pay for health costs and community health workersâ&#x20AC;&#x2122; salaries. MODEL 4: Payment in agricultural commodities - In some lowincome countries such as South Sudan, areas relying on subsistence agriculture do not have a cash economy. The researchers are exploring the viability and feasibility of having the health workers receive payment in agricultural commodities with the support of an organization like BRAC. By generating evidence and recommending effective social enterprise models for community health workers, the research team aims to make a significant contribution to improving womenâ&#x20AC;&#x2122;s economic empowerment and maternal and child health. The ultimate goal is to reduce maternal and child mortality and turn CBU research into action for some of the most vulnerable people in the world. In December 2016, CBU announced the launch of three new Open Online Learning courses: The Meaning of Life, Food and Culture and Positive Psychology each beginning in January 2017. The courses were launched with one main goal in mind: to create widely accessible learning opportunities and connect communities through education. “It is in society’s interest to make learning available to all citizens, and CBU has a strong mandate to our community to do just that,” says Dr. Tanya BrannBarrett, Dean of Research, Teaching & Graduate Studies. “Open Online Learning helps us fulfill this mandate, as we can reach out to people across the Island, country and world and invite them to learn with us.” To ensure the courses were accessible to a broad audience, learners were able to choose from a number of options when enroling including studying for credit, certificate of participation or simply out of curiosity. While learners studying for credit had the option of enrolling in class or online, certificate and curiosity students joined online through a live webcast, video archives and social media. Online learners were able to engage in course discussions through the use of peer facilitators who monitored social comments and posts from within the physical classroom. In addition to students who have registered for credit, the Open Online Learning courses saw over 850 unique registrants for a certificate of participation or curiosity, with many learners enrolled in more than one course. Although the goal of offering such courses was to open access to a wide range of learners, the vast diversity of registrants came as a surprise. “We had a wide age range of learners sign up from teenagers to people over 90,” says Peter McIntyre, professor, currently teaching Positive Psychology. “We have single parents and folks with medical conditions who appreciate the ability to learn online. We’ve had people join from all over the country, the USA and Iceland.” With the positive feedback and outstanding enrolment numbers, CBU is planning and looking forward to offering more open online courses in upcoming semesters. Cape Breton University has a long history of working with, and in, the Mi’kmaq communities in Nova Scotia. For more than 40 years, CBU has been the university of choice for Atlantic Canada’s Indigenous students. A big part of that is due to the ongoing work at Unama’ki College. Unama’ki College promotes Indigenous culture, education courses and programs within the broader CBU community and continues developing, implementing and maintaining dialogue between CBU and Indigenous communities across Canada. It is the uniqueness of Unama’ki College that enhances excellence in Mi’kmaq education, research, scholarships and culture within CBU as well as on a regional, national and international level. The timelines shown here give a brief overview of the work CBU has been doing with Indigenous communities and in Indigenous education over the last 40 plus years, with a specific focus on events over the last year and a half. We sometimes forget how wide-ranging Cape Breton University’s founders imagined its functions in, and service to, Cape Breton—among them, the Beaton Institute, the Art Gallery and a publishing house, CBU Press—all in 1974. Alongside the playhouse, these entities connected “town and gown” enhancing the Island’s cultural self-awareness and integral to the University’s overall mission. This year, CBU Press, as we know it, will undergo a rather big change. First, a bit of history. CBU Press—College of Cape Breton Press 1974; University College of Cape Breton Press, 1984—was not envisioned as a scholarly press, nor has it operated as such. Rather, it has published books in a wide range of genres including award-winning children’s books (including young adult) and adult fiction. Known as a trade publisher (as opposed to scholarly), even books rooted in academic research (some of which have earned writing awards) have mostly been edited for a general audience. The Press also published recordings, marshalling its resources to fulfill a perceived need for recordings unique to Cape Breton—among them: Rita MacNeil, the Cape Breton Symphony, the Rise and Follies and the Cape Breton Summertime Revue. Recordings aside, CBU Press published more than 170 books between 1974 and 2017, earning accolades and royalties for countless authors, while contracting other creators such as artists, photographers and editors. In 2003, the Press’s first dedicated editor-in-chief was appointed. Cape Breton authors were promoted to a wider audience by publishing adult fiction, beginning, notably, with Frank Macdonald’s best-selling, A Forest for Calum (2005), and David Doucette’s, North of Smokey (2006), and the remarkable novel, Cibou, by Susan Young de Biagi, all of who were runners-up for Atlantic Book Awards. A Forest for Calum, one of Cape Breton’s most endearing novels, was long-listed for the International IMPAC Dublin Literary Award, the world’s richest literary prize for a single work. Macdonald’s second novel, A Possible Madness, was also long-listed for the IMPAC. In 2012 and 2013, the Press published Cape Breton historical fiction for young adult readers: Trapper Boy, by Hugh R. MacDonald; Blood Brothers in Louisbourg, by Nova Scotia writer, Philip Roy; Me & Mr. Bell, also by Philip Roy and The Manager, by Ontario author, Caroline Stellings. These latter two were both shortlisted for TD Canada Trust Children’s Book Awards. Hugh R. MacDonald recently (2016) published a stand-alone sequel to Trapper Boy, titled Us & Them, also from CBU Press. Historical fiction was carving out a literary niche for CBU Press. When award-winning historian, A.J.B. Johnston, retired from Parks Canada in 2011, he turned his hand to three Thomas Pichon novels—fictionalizing the largerthan-life persona of one of the 18th-century’s most enigmatic figures. There is plenty of Celtic and Gaelic material in Cape Breton, resulting in an impressive catalogue of books on music, dance, poetry and language. The Press was mindful of the need to include all of Cape Breton and sought to publish works by, and for, the Mi’kmaq and Acadian communities with some success. For most of its history, CBU Press was one of only two conventional publishers focused on the Island’s literary output. Recognizing this fact, the University has been continually supportive of the Press’s activities—including one-offs like writing workshops for teens, conferences and helping to found a popular monthly book pub in Sydney. CBU Press has focused on getting local voices heard by using the University’s resources for worthwhile projects that most mainstream publishers would reject. In recent years, the Press has published as many as 12 new books in the run of a year, from 17th & 18th-century French gastronomy, to solving the mystery of Oak Island and to the Naughty Little Book of Gaelic. For a number of years, it was the Press’s plan to gradually increase the volume of scholarly publications and, thus, better support the University’s core mission of teaching and research. Scholarly books required more subsidization due to their limited appeal, and a thriving trade list was needed to support the necessary critical mass to branch out. Additional resources would be needed, however, and it was decided to continue to focus on what it knows best. There are many more avenues for Island writers today than there were in 1974. Those avenues make it easier to be in print; at the same time, there are more and more new books, which means greater effort is needed to promote and market. In order to sustain its publishing program, the University would have to devote more resources to its Press. In 2014, in the face of a host of larger issues facing the University, the decision was made to discontinue the CBU Press as we know it today. There will be future publications on an ad hoc basis and under co-publication arrangements. Projects already in the works have been fulfilled and responsibility for all books in print are being taken over by the Press’s long-time distribution partner, Nimbus Publishing of Halifax, ensuring that books remain available and authors receive royalties. After 40-plus years covering Cape Breton, it’s time for others to work with creators to bring the Island’s considerable literary talents to the world. and the times they shared with these friends at social events hosted by the Students’ Union. They both also fondly reflect on their time attending athletic events, especially supporting the men’s hockey program. Marlene, Glenn and their family members can often be seen on the sidelines of the basketball court supporting our current CAPERS. Both Marlene and Glenn were former athletes; Marlene was a tri-sport athlete playing for the CAPERS soccer, basketball and field hockey teams, while Glenn was a member of the very successful CAPERS men’s hockey program. Marie was also a member of the CAPERS women’s basketball team while Ronnie and Peter McCarron both captained the hockey team during their tenures at CBU. sister’s wrongful arrest. In 2009, the Mayor, Barrie MacMillan, wrote back to Wanda indicating that the city council had agreed to offer an official apology and would acknowledge the Roseland Theatre incident with a commemorative bench to be placed at the town’s African Heritage Memorial Park. 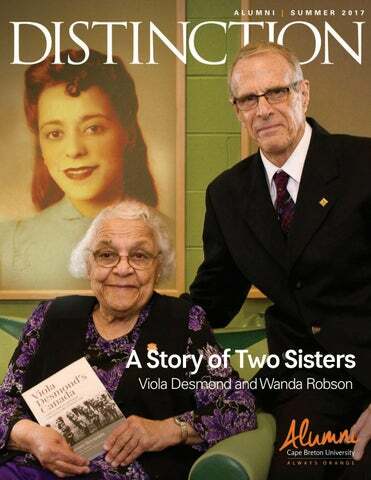 The ceremony occurred in 2010 and coincided with the launch of Wanda’s book, Sister to Courage: Stories from the World of Viola Desmond, Canada’s Rosa Parks (Breton Books, 2010). That same year, the Nova Scotia government granted the free pardon to Viola, and former CBU President, John Harker, created the Viola Desmond Chair in Social Justice and appointed Dr. Reynolds as the first holder of the Chair. Following the historic events of 2010, Viola’s national stature rose very quickly. In 2012, Canada Post issued a commemorative stamp in her honour. In 2014, The Museum of Human Rights in Winnipeg created a permanent display memorializing the Roseland Theatre incident as a uniquely Canadian story of courage. In 2015, the Nova Scotia government created Heritage Day, a new provincial holiday, and named February 15 of that year the Viola Desmond Day. Later in 2015, the Historic Sites and Monuments Board of Canada accepted the nomination of Viola Desmond as a person of national historic significance. No one could have foreseen the speed and extent to which the Viola Desmond story would resonate with Canadians everywhere and that, by the end of 2016, she would be chosen as the first Canadian woman to be represented on a banknote. This historical milestone and public acknowledgment are an inspiring illustration of how these two remarkable sisters have had such a lasting impact on Canadian society. Viola’s non-violent act of resistance against injustice helped bring an end to the practice of racial segregation in Nova Scotia. Over half a century later, Wanda fulfilled her dream of obtaining a university education, and this empowered her to seek the long, overdue justice for her sister’s wrongful arrest. Together, their actions have helped make Canada a more just society and have given an example of courage and hope for us and all future generations. A Seat at the Table Cape Breton women patriciate participate in the Canada - U.S. Council for Advancement of Women Entrepreneurs and Business Leaders On February 13, 2017, two Cape Breton women were invited by Prime Minister Justin Trudeau and President Donald Trump to participate in a joint Canadian/US roundtable discussion on women in the workforce. CBU’s Chancellor and Cape Breton’s own favourite North Sydney farm girl, Annette Verschuren, along with CBU’s newly minted Honorary Degree recipient and Port Hood’s, Deborah Gillis, made certain that Cape Breton was well represented. Both women were part of the historical meetings as top Canadian and American female entrepreneurs discussed issues on women in the workforce and held dialogue on ways to eliminate barriers facing women entrepreneurs. Annette Verschuren is the past President and CEO of The Home Depot Canada & Asia and currently the President and CEO of NRStor Inc. NRStor is an energy storage project developer and owner focused on developing and constructing energy storage technologies. Deborah Gillis is the President and CEO of Catalyst, the leading international research and advisory organization working to accelerate progress for women through workplace inclusion. Leaving a Legacy On July 6, 2016, Our Alumni Family Lost a True Friend - Darrell Flynn The Cape Breton University Alumni family is global. The CBU story is being actively told and promoted around the world. Darrell Flynn, past Alumni president, was a loud and proud ambassador of CBU and the Alumni family. He proudly displayed his Bachelor of Business Administration degree at his business for all to see and always welcomed the opportunity to promote CBU’s unique educational experience. Darrell was a CBU Alumni success story. He was a beloved husband and father, entrepreneur (Swiss Chalet), Cape Breton Regional Municipality council member, Cape Breton-Victoria Regional School Board member and volunteered with many other organizations and committees. Darrell will be remembered for his integrity, kindness and leadership. Darrell embodied the true spirit of CBU without obligation or hesitation and took great pleasure in helping others. His approachable and understanding manner made it easy for people to converse with him. Leijsa Wilton (Alumni Board Member) wrote, “He set the bar high for being involved in his community on many levels, and he selflessly donated his time as well as Swiss Chalet ‘product’ to any fundraiser, hockey tournament, golf tournament, charity auction... the list goes on.” Don Vaters, long-time friend wrote, “We could talk about all he had done... but when it comes right down to it, he was a true friend to all. Great friends are hard to find, difficult when they leave us, impossible to forget.’’ Darrell exemplified all that CBU aspires for its students and alumni – the skills, knowledge and attitude to succeed – and the character, wisdom and responsibility to contribute to their community. He has left a legacy that will inspire future generations of CBU Alumni. Breton Brewing Co. first opened as a brewery and retail area in June 2015 and quickly expanded to include a tasting (bar) area in July of the same year. Within just two short years, the brewery has grown from selling products in-house only to now being stocked at 75 Nova Scotia Liquor Commission locations and select restaurants across Nova Scotia. In 2017, Breton Brewing plans to launch in New Brunswick. Andrew attributes much of his curiosity, perseverance and brewing skills to his time spent at CBU. “The Bachelor of Science degree I received through CBU applies extremely well to the brewing industry,” says Andrew. “Whether altering water chemistry for the mash, adjusting temperatures for specific enzymatic activities or harvesting yeast for future use, my education is always coming into play.” Andrew and Bryan look forward to continuing the growth of Breton Brewing and focussing on producing high quality products and intersecting new markets, as well as supporting the growth of the Nova Scotia craft beer industry. So far, the uptake and support from the local community has been extremely positive, allowing the business to grow at an impressive rate. To return such generosity and show their support for the local business community, Bing and Asher are very careful to shop local when it comes to their business needs. “We use a legal firm next door, we had Finishing Touch design and assist with our décor, the wall paintings were done by an artist who is a friend of ours, we use the local KKP printing and many other services in the area,” said Bing and Asher. Although Bing and Asher have been learning an exponential amount since graduating from CBU, the pair feels their experiences in the BHTM program have contributed greatly to the restaurant’s success. “Through the BHTM program we were able to learn cooking skills, marketing skills and business strategies,” says Bing. “We are really grateful for the tremendous support we did, and still, receive from our professors. They come to the restaurant often and support our venue.” Bing and Asher look forward to staying in Cape Breton and have plans to open a patio off the restaurant to offer visitors an outdoor dining experience. For Dr. Young, a graduate of CBU’s engineering diploma program, she discovered a love for math and science in high school but cultivated that love during her time at CBU. “In 2003 and 2004, I had the opportunity to work as a research assistant with Dr. Adango Miadonye on a project related to bitumen upgrading and asphaltene extraction,” says Dr. Young. “This was my first exposure to working in a laboratory environment. This experience led to the development of critical analytical skills and my passion for R&D.” Dr. Young’s drive and work ethic pushed her to continue her educational journey, and she went on to earn a degree in Chemical Engineering, as well as a Doctor of Philosophy in Chemical Engineering. But the entrepreneurial spirit was in her blood. “In the 1990s, my parents had a construction company of the same name, DAVAL Construction,” she explains. “I have so many great memories of the business and their entrepreneurial spirit that DAVAL seemed like the perfect fit for me for when I launched my own business.” Inspired by other young entrepreneurs, Dr. Young looks to leaders like Breathing Space Yoga and Breton Brewing as shining examples of success, saying, “I think it is encouraging to see young, local Nova Scotians working hard to successfully achieve their goals in starting a small business. My initial goal was to sell 50 lipsticks in a year, but I have been surprised by the interest so far.” Partially thanks to the power of social media, DAVAL Beauty has seen great success in its first year. “Instagram and Etsy have been pivotal in DAVAL’s growth,” says Dr. Young. “They have provided a platform to promote DAVAL and to connect with others. I love seeing customers rocking their favourite DAVAL shade on Instagram, and I love that I have the opportunity to thank them for their support. It’s so important to me to stay actively engaged with my customers and to hear their feedback.” Dr. Young reflects on her educational journey and wants other young scientist to know that. “Through your education, you will gain valuable analytical and critical thinking skills. Use them to find a career that suits you and that you enjoy.” DAVAL Beauty products are 100% handcrafted, vegetarian, cruelty free, talc free and paraben free. They can be purchased online through the DAVAL Beauty Etsy shop. Critical thinkers and problem solvers by nature, Danielle and Mark Patterson are always looking for innovative ways to make life easier and more efficient. 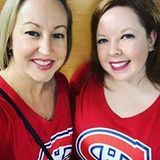 Both from Sydney, NS, the married couple spent several years working across North America in locations such as Newfoundland and Florida, when they decided to make the move back to Cape Breton and become their own bosses by tackling what they refer to as a real world problem. With Mark as CEO and Danielle as COE, the pair is working hard to expand their services and market Docmaster across Canada. Recently expanding to bring in a Chief Technology Officer, the company also merged and re-launched a progressive IT Solutions company. Today, they have more than 40 clients across Cape Breton Island and Atlantic Canada and are looking forward to further expansion. It was out of this sentiment that the Patterson’s developed the business model for Docmaster, a web-based document storage and management solution. Docmaster offers a secure way to store information as well as the software to help quickly retrieve it, adhering to all federal and provincial data laws. Mark, a BSc graduate, and Danielle, a current MBA (CED) student, are happy to be home and surrounded by a network of proud supporters. CBU Alumni Association The CBUAA is constantly looking for ways to engage with alumni and friends. Here are a few highlights of the various events and initiatives they were involved in this year! Former CBUSU Presidentâ&#x20AC;&#x2122;s with their copy of Negotiating So Everyone Wins at the David Dingwall book launch, hosted by the CBUAA. Several members of the CBUAA Board of Directors gather together after an evening of celebrating the closing of Spring Festival at alumni owned business Bite of Asia. A team of alumni joined together for the Big Bike Challenge, raising money for the Heart and Stroke Foundation and dedicating the ride to past CBUAA President, Darrell Flynn. Alumni in Toronto join Chancellor Verschuren for a Cape Breton Ceilidh complete with east coast food, drink and fiddle. Standing out in the crowd, a team of alumni participated in the annual Spring into Motion event completing various physical challenges raising money for the local YMCA. CLASS NOTES 2016 MESHAK LUFILE, BACS, signed a professional contract to play basketball in the Netherlands in the Dutch Basketball League (DBL). Meshack is playing in the top division for Arisleeuwarden, a team based out of Leeuwarden, the capital of Friesland. 2013 NICOLA JACKSON, BACS, and Steven Musgrave welcomed their bundle of joy, Xavier Frederick Steven Musgrave, into the world on February 20, 2017. 2011 DR. JEFF CLEMENTS, BSc, BBA, continues to amaze; he will be completing postdoctoral research in Europe after being awarded the prestigious Marie SklodowskaCurie Individual Fellowship from the European Union. Dr. Clementsâ&#x20AC;&#x2122; research is based on the effects of ocean acidification and warming on the social behavior of marine animals. Congrats Dr. Clements! 2010 LACHLAN MACKINNON, PhD, BA, has had a very exciting year. After completing his PhD from Concordia University in October, Lachlan took up a Postdoctoral Fellowship at SMU as well as teaching courses in the CBU History Department. To top it off, Lachlan and his wife welcomed their son, Landon, to the CAPERS family. 2015 KAROLYNE BLAIN, BSc, was joined by her parents, past teammates and the Athletics Department as she was honoured as being one of the most decorated student athletes in CAPERS history. Her jersey will hang in the rafters at CBU as an inspirational reminder of her hard work, leadership and determination on and off the field. 2015 ANDREW SKINNER-RYAN, BBA, left CBU with a double concentration in legal studies and human resources and is now studying at the University of New Brunswick in the Faculty of Law Juris Doctor program. Good luck Andrew! 2008 TIFFANY BRIAND BOUDREAU, BA, and GRANT BOUDREAU, BTech, are proud to share the birth of their daughter, Heather Julianna Boudreau, born March 8, 2016. 2007 TIM BURNS, BA, and Lisa MacEachern, BBA, were married in a beautiful ceremony with family and friends who gathered in Dundee on July 16, 2016. 2007 JENNA TARR, BA, and David Dunlop celebrated the next chapter in their lives as they said “I do” in a magical ceremony on July 23, 2016, celebrated by their family and friends in Prince Edward Island. 1995 Former CAPERS men’s basketball sensation, JOHN RYAN, BBA, and TRACY RYAN, BHTM, are happy to see their eldest daughter Mackenzee commit to CAPERS athletics where she will wear the Orange and Green representing the CAPERS women’s basketball program in September. 2006 Teacher, author and former CAPERS point guard for the men’s basketball program, RYAN KELIHER, BEd, BA, released his first book titled, The Superstar Curriculum. A tool to show teenagers ways in which they can use their high school experiences to develop habits and qualities that will set them up for future success. 2006 JARRETT TIMMONS, BEd, is looking to help build the future CAPERS basketball program as he and his wife, Kara, welcomed their first son, Jack Michael, to the world December 2015 and are expecting another little CAPER late April. 2002 Honorary degree recipient, MATT MINGLEWOOD, celebrated his 70th birthday in style with the release of his newest album, Fly Like Desperados. 2000 CORDELL GRANT, BSc Eng, Howie Centre native and CBU alumnus, was named one of 72 candidates in the running to be one of Canada’s next astronauts. The successful candidates will be announced this summer. Sending positive vibes to infinity and beyond! 1990 We would like to congratulate Professor ALLAN FRASER, BBA, on his retirement and wish him all the best as he begins a new chapter in his life. Thank you for all of your time and commitment to the success of our many alumni and students at CBU. 1987 MICHELLE P. MORGAN-COOLE, BA, a Disability Lawyer of MMC Legal Services was recognized by Worldwide Branding for her dedication, leadership and excellence in legal services. 1971 Former Xavier College alumnus and honorary degree recipient, the Honorable DAVID C. DINGWALL, can now add author to his list of accomplishments. Mr. Dingwall recently released his book titled, Negotiating so Everyone Wins, a resource created to help those learn from Canada’s leading negotiation experts in an engaging and interactive format. Golfers enjoyed fair skies for their round at Cabot Cliffs. A Lasting Impact Two new awards established at CBU in support of CBU students. These awards, like the many awards CBU, is honoured to receive, leaves a lasting legacy of two extraordinary women who were truly dedicated to CBU and the education of our students. The Debbie Ruiz Always a Champion Award is a tribute to one of Cape Breton University’s former CAPERS student-athletes, Debbie Ruiz. From Montreal, QC, Debbie was a member of the women’s basketball team from 2004‐07 and was an assistant coach in 2008. A two‐time, AUS All‐Star, Debbie was the driving force behind the CAPERS 2006 AUS Championship win and CIS silver medal win – the first national medal for the CBU women’s basketball program. Debbie graduated with her BBA degree in 2008. Debbie was a champion on and off the court. She demonstrated a competitive desire, passion and courage each time she competed in a CAPERS uniform. She was an inspirational leader committed to her community, specifically with regard to helping young girls involved in sports. Sadly, Debbie passed away from cancer in July of 2016. This scholarship is intended to incorporate some of the characteristics that made Debbie unique and to help ensure that the memory, spirit and ideals that she represented are kept fresh in the minds of all CAPERS female athletes. Cape Breton University, in conjunction with CBU Women’s Basketball team/CBU Athletics, is proud to award this annual scholarship of $1,000 to assist with the educational support of a current member of the CBU women’s basketball team or an incoming entrance student committed to playing on the team. L. Jean MacFadgen Award The L. Jean MacFadgen Award was established to honour the memory of Jean MacFadgen. Jean (B.Sc. Dalhousie Univ., 1945, MSW, Wilfred Laurier Univ., 1980) valued family connections, educational access and community service in all aspects of her life – contributing her strong and unassuming leadership for the betterment of individuals and families in both east- and west-coast communities (Glace Bay, Cape Breton, N.S., and Nanaimo, Vancouver Island, B.C.) Jean had an enduring sense of community and social justice, working one summer with the first professional social worker in Nova Scotia, Jane Wisdom; Jane Wisdom was the topic for Jean’s Master’s thesis. Jean was one of the founders of the Glace Bay Citizens Service League and served on the Steering Committee of the Nova Scotia Status of Women and on the boards of College of Cape Breton and the Glace Bay Miner’s Museum. She would be pleased that her legacy included an education bursary of $550 that will help support CBU students who are facing financial and first‐generation challenges – especially those with a commitment to gaining skills and experiences that can be shared with their home communities in a variety of human service/ community development fields. Icons of Aboriginal Rights, Business, Education and Culture join the CBU Alumni Family At the 2016 CBU Convocation, honorary degrees were bestowed upon seven outstanding individuals who positively impact the world around them and who serve as an inspiration to our students. ASHLEY D. MACISAAC Doctor of Letters, honoris causa Born in Creignish, Cape Breton, Mr. MacIsaac achieved international recognition at an early age and is one of the most renowned Canadian roots musicians, with gold and platinum records. Mr. MacIsaac’s recognition includes three Juno Awards, appearances on the Conan O’Brian Show, the Today Show, at international festivals, theatres and halls worldwide including Carnegie Hall. He also performed in the opening ceremonies of the Vancouver 2010 Winter Olympics to a worldwide audience. His music includes 15 albums spanning three decades. A CBC show called, Celtic Edge, featuring Ashley was broadcast this past fall exploring the impact of the relationship between older and younger generations of fiddlers. Ashley continues to pass on the proud musical heritage and traditions of Cape Breton to the world. DR. PAULETTE TREMBLAY Doctor of Letters, honoris causa Dr. Tremblay, Turtle Clan member of the Mohawk Nation from Six Nations of the Grand River Territory of Southern Ontario, has been an educator for more than 30 years – earning a BA in sociology at Wilfrid Laurier University and a BEd at Dalhousie. She holds a Master of Arts degree and a Doctor of Philosophy in Education from the University of Ottawa. Dr. Tremblay is a Certified Aboriginal Professional Administrator (CAPA) and received the Institute of Corporate Directors Designation (ICD.D) from the University of Toronto’s, Rotman School of Business. Vice-President of Education and Training at AFOA Canada, CEO for National Aboriginal Health Organization, Director of Education at National Aboriginal Achievement Foundation, Senior Executive Officer for the Six Nations Band Council and the Public Service Commission of Canada are among her past roles. Dr. Tremblay is the former chair of the national advisory committee for the Purdy Crawford Chair in Aboriginal Business Studies. CHARLIE JOE DENNIS (POSTHUMOUS) Doctor of Laws, honoris causa Charlie Joe Dennis, Turtle Clan member of the Mohawk Nation from Six Nations of the Grand River Territory of Southern Ontario, has been an educator for more than 30 years – earning a BA in sociology at Wilfrid Laurier University. Mr. Dennis was instrumental in the development of many of Eskasoni’s fishery programs including the Unama’ki Oyster Farm, Eskasoni Fish and Wildlife Commission and Crane Cove Seafoods. He helped found the Unama’ki Institute of Natural Resources in 1999. Mr. Dennis was also named to the Atlantic Salmon Federation’s honour roll in 1994 and received the Cormack Award from the Margaree Salmon Association in 1995. In 2001, he received the Deputy Minister’s Certificate in recognition of his contributions to peace, friendship and co-operation between the Department of Fisheries and Oceans and First Nations. Mr. Dennis received a posthumous Lifetime Achievement Award from the Aquaculture Association of Nova Scotia for his outstanding contributions to the province’s industry, the community of Eskasoni and the Mi’kmaw nation as a whole. HEBA EL SEWEDY CIC - Cairo Honorary Degree Heba El Sewedy is the Founder and Chairwoman of the Ahl Masr Foundation. In 1994, Heba earned a Bachelor Degree in English Literature from King Abdul Aziz University. After graduation, Heba El Sewedy founded the Arabian French Textiles Company. In 2013, she founded Ahl Masr, a non-governmental organization for social development in Egypt. OMAR KHAIRAT CIC - Cairo Honorary Degree Born in 1948 in Cairo, Omar Khairat is one of the most successful and influential Egyptian composers. At the age of nine, having already taken piano lessons for five years, Mr. Khairat further developed his musical talents at the Conservatoire under the direction of Italian Maestro Vincenzo Carro. He was awarded honorary degrees from the University of Wales in 2013 and the American University in Cairo in 2015. 2017 marks an extraordinary time for women’s soccer at Cape Breton University. Long-time head coach, Stephen “Ness” Timmons, recently completed his 20th season coaching the CAPERS. Ness has led the CAPERS to unmatched success in Atlantic University Conference play. “Ness is considered one of the best coaches in the sport of women’s soccer in CIS history. We are thrilled that he has been leading our Women’s Soccer Program for the past 20 seasons. What he has done developing our studentathletes into outstanding, well-rounded young ladies when they graduate from his program is what brings me the most pride.” John Ryan, Director of Athletics at CBU Perhaps the greatest accomplishment of the CAPERS women’s soccer program, under the leadership of Ness, is the CIS National Championship. In 2007, CBU won its first, and only, National Championship. Cape Breton led the AUS standings that season with an outstanding 11-1-1 record and headed into the playoffs as favourites to win the AUS title. CBU was the host of the 2007 CIS National Championships and welcomed the best university teams from across Canada. In front of a home crowd, the CAPERS won and claimed the 1st National title in the University’s history. Ness had this to say about winning the title, “Winning a national title in the CIS gives the University immediate recognition. It creates a feeling of tremendous pride for all involved with CBU, and the Cape Breton community as a whole. The CAPERS brand certainly grew from that National Championship. On the recruiting trail, there was a spike in the number of interested students who had now heard of our school.” 2017 marks the 10th anniversary of the national title, and CBU will be celebrating this accomplishment during the season opening weekend on September 9th when the CAPERS play host to the Saint Mary’s Huskies. “It will be a great chance for the alumni to return to the place where they made so many great memories as CAPER varsity athletes. We know that soccer was a big part of their university experience here at CBU and to have a chance to return in the fall will be very special to share memories and renew old friendships. I know our players have always had a great sense of pride in CBU and playing for the CAPERS, so this will be great chance to share in all that.” says Ness Timmons. CBU added a new member to the athletics family Men’s Basketball coach, David Petroziello. Coach P, as his players call him, grew up in Quebec City and has been around basketball since he can remember. Basketball ran in his family – his Dad was his very first coach and continued to be a mentor to him throughout his career. Coach P. lives by a very special coaching philosophy taught to him by his parents, who have both passed away. They always said, “Your coach has you doing what you are doing because that is how to best contribute to your team.” To him, this is a philosophy that can apply to your personal, professional and athletic life. Cape Breton University welcomes Coach Petroziello and looks forward to being part of his vision for the University’s basketball program.